In military terms, the terrorist militia Islamic State (IS) has been virtually defeated in Iraq and Syria, with the participation of Jordanian-based German soldiers. Should the operation be extended after 31 October? Federal Defense Minister Ursula von der Leyen has called for a continuation of the fight against the terrorist militia Islamic State (IS). It must be prevented that the militarily beaten extremists in Iraq formed refuge, said the CDU politician. 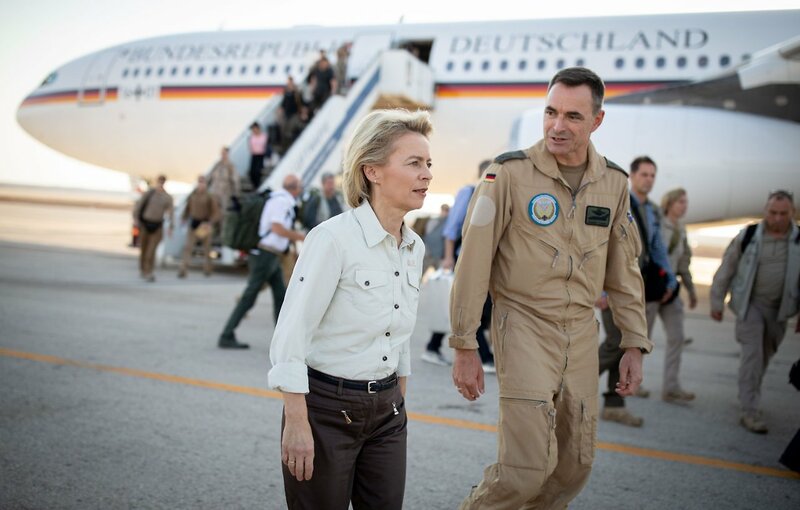 After a visit to the German contingent of the international anti-IS coalition in Jordan, she flew further to the Iraqi capital Baghdad. Von der Leyen was accompanied by defense politicians of the Bundestag factions. The Bundeswehr is involved from Jordan in the fight against IS in Syria and Iraq. The Bundestag mandate had been extended to train specialists in the Iraqi army and to advise the government in Baghdad. It is valid until 31st October and will then be renewed. The stated goal is to stabilize Iraq. "The acute struggle for the territory formerly occupied by the ISIS is over, and it is now important, among other things, to shape and protect the reconstruction of the country under a new mandate," von der Leyen said. "Germany is ready to help Iraq continue to get on its feet, that's why I'm here." First, the delegation visited the Bundeswehr in Jordan. The German mission contingent of the alliance against the IS belong to the air force base Al-Asrak in the east of Jordan about 290 soldiers. There are four "Tornado" reconnaissance jets and a tanker in action. On the question of a soldier, whether there are considerations to strategically settle in the Middle East, said of the Leyen: "I do not want to exclude the idea, so I will say." After the terrorist attacks in Paris in November 2015, the Bundestag had decided to militarily support France and the international coalition against ISIS. The extension of the mandate for the new tasks in Iraq was decided in March with the votes of the grand coalition. While the Bundeswehr primarily supported the Kurdish Peshmerga in northern Iraq with training and weapons against ISIS, soldiers are being trained in central Iraq under the term "capacity building". For this purpose, a pilot project for the training of specialists in ABC defense began on 11 August in a military complex in Taji, north of Baghdad. The defense politicians of the factions get a fresh impression. In March, 359 MPs voted for the mandate, 218 against, 79 abstained. Left, Green and AfD were against it, the FDP abstained. The opposition feared that the Bundeswehr might get caught in the conflict between the Kurds and the Iraqi central government.